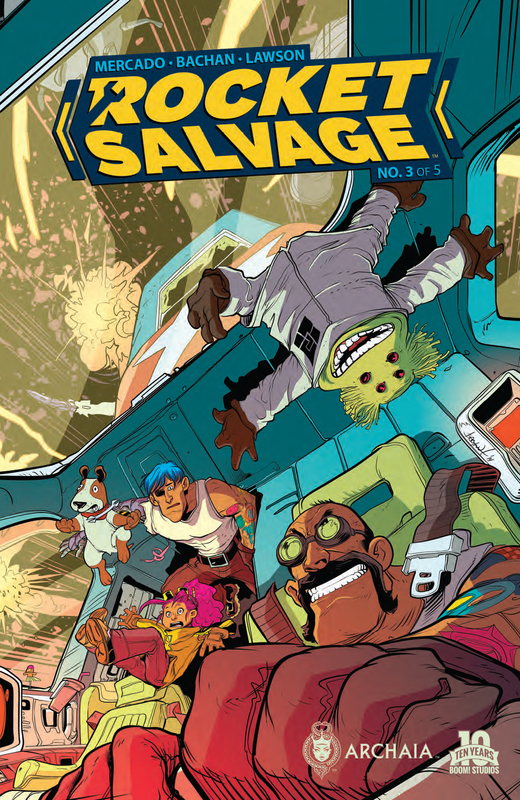 Rocket Salvage #3 continues to be genuinely entertaining and look good while doing it. This issue, not only do we get to see Beta Rocket’s “origin” but we get to see Zeta unleash herself as the weapon using her Mechakinesis. Yes it’s a mouthful, but man is it impressive. (It’s like telekinesis, except she can control machines.) Plus, we get to see Primo uncork some high speed antics that made him famous in the first place. Plus, there’s a bunch of explosions which is always fun. I can see where some folks might not give Rocket Salvage a chance. (Kind of like how some folks don’t’ give hair bands the musical credit they’re due. Like it or not, a ton of those dudes could legit tear it up. I’m looking at you George Lynch.) But don’t let the bold colors and cartoony nature of the art fool you. There is some solid rockin’ happening here. I mean, what do you want when you go to a concert? You want to plug into a visual and audio extravaganza. And that’s what you get with Rocket Salvage. A spectacular visual onslaught brought to you by Bachan, and a solid story thanks to Yehudi Mercado. Plus, in this issue, we see the family aspect really come into play with Beta actually stepping up and surprising everyone. 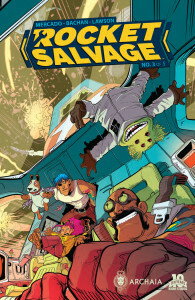 Rocket Salvage is flat out, glam metal, fun. So slap on some spandex, your acid wash jeans, get out your Aqua Net and get ready to rock.